Alto saxophonist and bandleader Hal McIntyre worked with several local bands in his native Connecticut before forming his own eight-piece outfit in 1935. In 1937, McIntyre was hired as a temporary replacement in Benny Goodman’s orchestra. Though the job lasted for only ten days, he caught the ear of Glenn Miller, who was busy organizing a new band. McIntyre became the first musician hired for Miller’s group, only to see it break up after a few months due to financial problems. When Miller made another attempt in 1938, McIntyre signed on again. This time Miller succeeded, and his orchestra soon became the hottest band in the country, with McIntyre an integral part of its now famous sound. 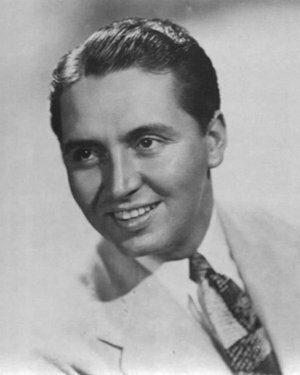 McIntyre quickly became close friends with Miller, and in 1941 the bandleader convinced him to form his own group, offering to back it financially. Billed as “The Band That America Loves,” McIntyre’s orchestra debuted that same year at the Glen Island Casino. The group proved quite popular and went on to play at many of the top venues around the country, including at the Statler Hotel in Washington, D.C., for President Roosevelt’s Birthday Ball in 1945. Vocalists included Helen Ward, Gloria Van, Ruth Gaylor, Carl Denney, Terry Allen, and Al Nobel. Dave Matthews, Ralph Flanagan, and Howard Gibeling arranged. The orchestra’s standout musician was bassist Eddie Safranksi, who later went on to greater fame with Stan Kenton. Saxophonist Les Elgart also played with the band. In 1945, McIntyre took his orchestra overseas on a USO sponsored tour. He was forced to quickly hire several new musicians and his male singer, Jimmy Cook, when some of his key men failed to meet the requirements for the trip. Frankie Lester replaced Cook. This change in personnel caused his sound to briefly suffer, though he managed to get the band into shape again by the time they returned to the states. The group remained together into the 1950s, providing backup for the Mills Brothers 1952 hit “Glow Worm.” Hal McIntyre died tragically in a house fire in 1959. In his early years McIntyre had also played clarinet but stuck exclusively to saxophone while leading his orchestra.